CNN asked Martin Parr to document the Republican National Convention. Martin Parr! In an age where photography is increasingly seen as disposable it’s nice to see CNN bringing in heavy hitters like Alex Webb and Martin Parr to document the RNC in very different ways. While Webb spent a week in Cleveland documenting the people and places of the convention’s host city, Parr looked directly into the mouth of the dragon and came away with a very different set of images. Many of Parr’s shots revolve around the little details. Almost as if he’s an archaeologist piecing together the aspects of an ancient society by studying the garbage they left behind. 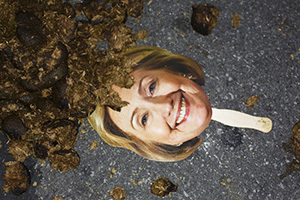 From Hillary masks covered in horse manure to branded RNC hot sauce, he sees the commodification of the political process shining bright. As surprised as he was by the jetsam of the U.S. political process, he was equally shocked by the deplorable behavior of the media. Members of the press were like dogs fighting over the same scrap of meat. Everyone scrambling to report the exact same thing with a visciousness that usurped his proper British sense of decorum. But in the end, the strange inhabitants of this world were the true stars of the show. Unconventional: An outsider’s look at the RNC. Listen, I’m a big fan of Martin Parr and eagerly consume any and all new work that he produces. But I have to be honest. I’m just not… moved by these pics the way I normally am from his work. It almost feels like he’s just going through the motions for a lot of the shots and there’s some questionable focus choices that really prevent me from enjoying the images. But on the whole I can’t help but feel that Parr missed the mark this time. Take any of these shots and put them in a Flickr street photography critique group and how would they hold up? Apart from the funny little details, there are lots of images featuring backs of people’s heads and a few characterless crowd shots. You almost have to wonder if Parr’s vision is at a disadvantage when he’s out of his element and shooting in a foreign country. However you feel about the shots, it’s great to see CNN hiring big names in photography to document their stories and Martin Parr’s take on the U.S. political process is worth the read alone. What’s your take on Martin Parr’s Republican National Convention pics? A fresh look at a tired old political convention? Or do his images miss the mark? Post your ideas in the comments below and keep the conversation going!